Welcome to Julias's G-Tube Pads. Thank you for visiting my new Internet site. I want to give you the opportunity to stay in touch with me and what I have to offer. At this point I can provide you with information regarding g-tube pads, trach ties and bibs. The emphasis of our site is to provide affordable special needs items to all. If there is something that you are in need of that you don't see on the website, please contact me and I will see what I can do to help you. I am looking forward to hearing from you. You can also contact me at my e-mail address: jzachreson@rcsis.com or use the contact button and send a message to me. If you are not familiar with my products and your first contact with us is online: I would be pleased to hear from you! Please let me know what your needs and questions are, I will be more than happy to help. 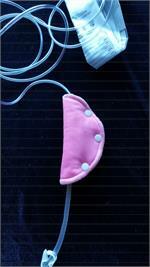 Washable and Reusable G-Tube Pads. Sold in sets. Double pad is made with one side cotton fabric and flannel on the other with two layers of warm and natural batting in the middle with a plastic snap. Washable and Reuseable G-tube pads Sold in sets. Double pad is made with one side cotton fabric and flannel on the other with two layers of warm and natural batting in the middle with a plastic snap. 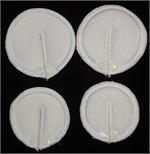 Single 2.5 inch and 3 inch G-Tube Pads sets. Washable and Reuseable G-tube pads Sold in sets. Single pad is made with both side flannel and with one layer of warm and natural batting in the middle with a plastic snap. Each set has 12 pads. Electonic Gift Certificate. After purchases a certificate number will be sent to you or the person you choose to redeem the total value of the e-gift certificate. Washable and Reuseable G-Tube Pads. Build your own set. Receive .25 cents off each if you order 12 or more. Washable and Reuseable G-Tube Pads. Build your own set. Single pads are made with flannel fabric on the outside with one layer of warm and natural batting in the middle with a plastic snap. Receive .25 cents off each pad if you order 12 or more. Price: $3.50 each Other Fabrics are available. We can match port / connector cover with most G-Tube Pads. Please contact us . Price: $15.00 Custom made to order. Please contact us before ordering to choose the color of fabric. 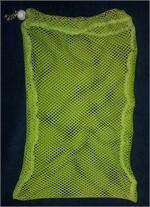 The G-tube/ PEG protector wrap is made out of cotton and flannel material with a velcro closer. It is nice for protecting the site from having the tube /PEG pulled on. It is also a nice protection from hands that like to play with their site. Price: $5.00 Custom made. Please contact us before ordering. Thank you. Washable & Reuseable Trach Ties. 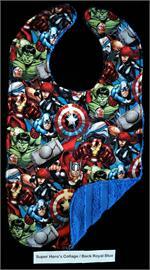 Reversible Drool Bib. 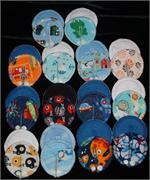 The bibs are constructed with a layer of fabric, waterproof material and then toweling. These currently have a snap closure, or velcro. Reversible Drool or Feeding Bib. 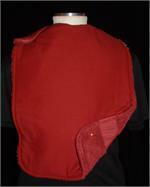 The bibs are constructed with a layer of fabric, waterproof material and then toweling. These currently have a snap closure, or velcro.